STAR TREK: "The View From The Bridge" Review | Warped Factor - Words in the Key of Geek. Matthew Kresal reviews Nicholas Meyer's 2009 memoir, The View From The Bridge. As the author himself notes at one point, “Everyone connected with Star Trek writes a memoir.” Some have been honest and candid, others perhaps more self-serving than others. 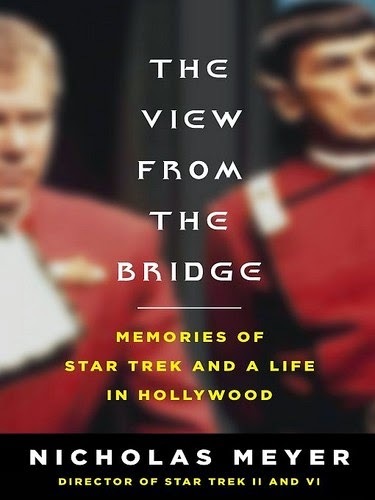 The View From The Bridge by Nicholas Meyer, the man who brought us not only three of the better Trek films but the Sherlock Holmes meets Sigmund Freud novel The Seven Per-Cent-Solution and the classic 1983 TV movie The Day After, certainly falls into the former category rather than the latter and also presents the reader with an overview of a career where which Trek is only a highlight. Meyer is perhaps best known for his work on three of the best Star Trek films (II, IV and VI respectively) so it is no surprise then that the bulk of the book is made up with his recollections regarding them. Those who've seen or heard Meyer in the extras on the DVD releases of those films will likely find some stories being retold (such as his directing Ricardo Montalban's first scenes as Khan, and how one Paramount executive wanted subtitles translating what the mysterious alien probe in Star Trek IV was saying, to name just two examples). In other cases there are interesting and candid thoughts being shared, such as Meyer's thoughts in retrospect about his dealings with Gene Roddenberry on Star Trek VI, of which Meyer is understandably less than proud. It's also interesting reading his thoughts in hindsight on the two films he directed (II and VI) with a couple of decades worth of perspective, particularly in regards to the plot of Star Trek VI in relation to the world we live in today. For Trek fans (which I suspect makes up the majority of those reading the book), these chapters make it well worth a read. 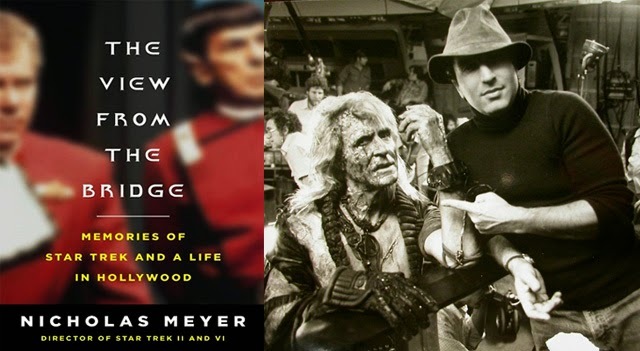 While Meyer's Star Trek work takes up the larger portion of the book, Meyer takes plenty of time to talk about the other projects he's worked on. The book covers everything from the author as a struggling writer, to his big break with the surprise bestseller The Seven Per-Cent-Solution, to directing his first feature film (1979's Time After Time) and later films such as Volunteers with Tom Hanks and the Merchant Ivory period piece The Deceivers with Pierce Brosnan. Meyer covers the ups and downs of his career with a refreshing candidness that allows to him to both point out his own shortcomings as well as those of others (and how they helped and hindered various projects) without being self-serving. Good examples of that is the somewhat lengthy chapter on The Day After, the nuclear war centric TV movie that Meyer directed for the ABC network in 1983, which gained both large amounts of controversy and the highest viewing figure for any TV movie ever aired. Meyer details the uphill fight to not only make it as he wanted but even to get it broadcast at all, and a later chapter on the film Company Business where Meyer's clashes with actor Gene Hackman undermined the film considerably. The View From The Bridge then is a look at the extraordinary career of a man who, while not a household name, has nevertheless created some of the best known tales in popular culture from the last couple of decades. From Star Trek to Sherlock Holmes and The Day After, Meyer shows us how his talent and determination allowed him to entertain millions with novels and films that were entertaining and at times thought provoking. The results, for fans of Trek and Meyer's work at large, make for fascinating reading.